The label Erased Tapes lies perfectly at the crossroads of craft today, from instrument building and modification (electronic and acoustic) to performance and composition (again, electronic and acoustic). And a new collaboration weaves together all those threads. We couldn’t be more pleased to get to share the first exclusive track from that project, as well as announce an event we’ll co-present here in Berlin in June. 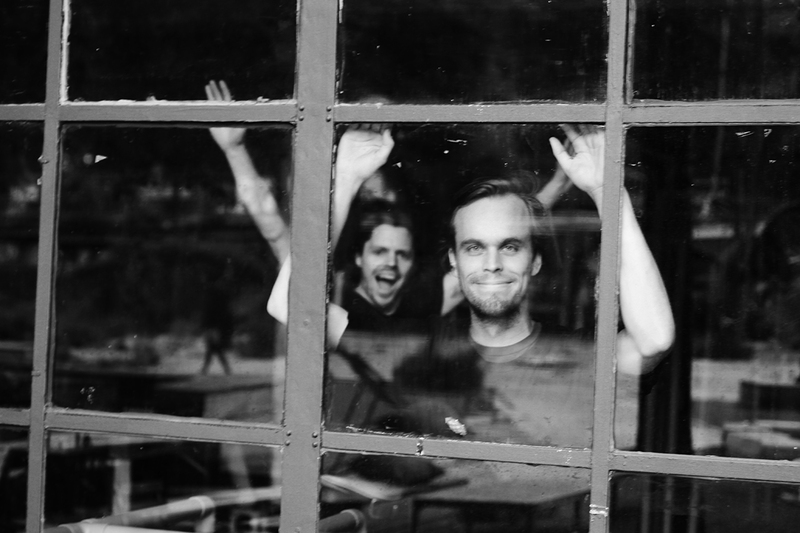 Peter Broderick and Greg Haines are each multi-instrumentalist composers, at home singing and playing instruments both new and old. Their relationship spans several years, but this year brings the debut of a finished record from that collaboration. Greg Gives Peter Space is a unique hybrid of cosy folk and spacey dub, producing a sound a bit unlike either one. And in a live context, the matrix of synths and effects they use in improvisatory constellations should produce a more far-out space journey than the living room-close sound you get here. Either way, it’s gorgeous stuff, the product of the care these two artists bring to the work of sound design and songwriting and performance. On the evening of June 9, the duo will join us in an event we present with Berghain Kantine and Erased Tapes. (Details below, if you’re in or near Berlin.) The record is out on digital and vinyl June 16. Peter Broderick – I’ve Tried (Live Studio Version) from Erased Tapes on Vimeo. Then there’s Greg Haines, whose edits and re-edits and re-recordings and reworkings of instruments and synths alike produces a thick stew of echoing, fuzzy sound – a slow-cooked electronic stew, having smoked for countless hours. His own opus from last year, “Where We Were,” is a rich epic, on Denovali – and defies logical SoundCloud tags as well as genres. At the same time, he’s just at home massing sound and texture with contemporary ensembles. This is, to me, post-minimalist classical writing at its essence: harmonies and rhythms often hew to the simple, but color and timbre rise to the fore, in just the sort of language the course of 20th Century writing seemed to predict. 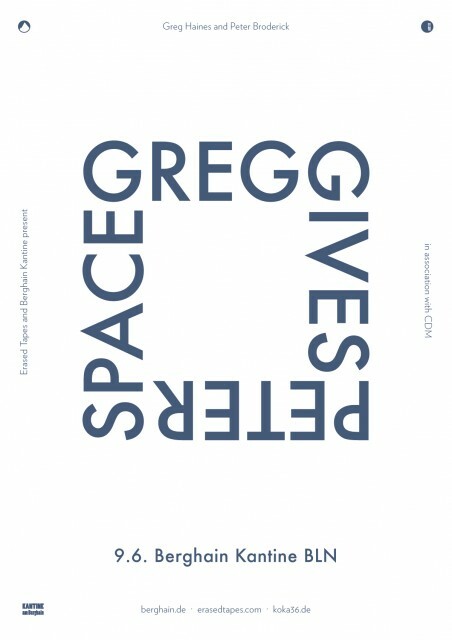 Description: Greg Gives Peter Space – after years of playing fairly quiet music for an often seated audience Peter and Greg can’t wait to get on stage and bounce around to some groovy rhythms, heavy bass and spacey synthesizers. Prepare for take off! Finally, I want to close with this video that Peter Broderick shares. It’s a brief documentary about luthier G.D. Armstrong. Hailing from nearby Oregon countryside to where Peter himself grew up, the instrument maker constructed the violin that follows Peter on tour. This is the sort of love of the making of instruments that I imagine unites caring artists in the 21st Century, whether it’s the construction of a monome controller, a Max patch, the slicing of a sample, the making of a score, or an acoustic instrument with centuries of history. And it’s an honor to get to celebrate those things with these artists and labels, together in a room and here online.